Abby Glassenberg started her blog, While She Naps, in 2005 to record her work in the studio making dolls and toys. As her work became more career-oriented and grew in popularity, Abby turned her passion for designing and sewing stuffed animals into a thriving business. Today, she writes craft books, licenses her designs to national companies, sells her sewing patterns and e-books, has a podcast, and teaches sewing and business practices. 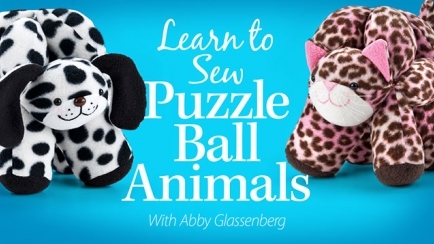 She is the author of the Annie's book Sew & Play Puzzle Balls and instructor for Annie's online class, Learn to Sew Puzzle Ball Animals. See more of her work at www.WhileSheNaps.com.